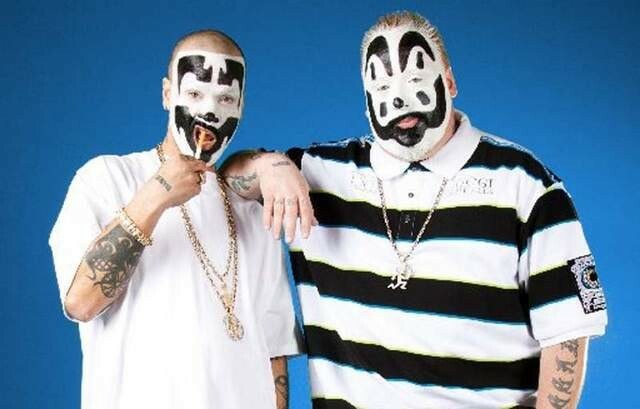 Insane Clown Posse members Shaggy 2 Dope, left, and Violent J hit record stores across the nation for the next month promoting their new album. Break out the face paint! Tonight, the Detroit-based horrorcore duo Insane Clown Posse come through town as part of their "The Marvelous Missing Link’s Traveling In-Store Insanity Tour.” Yes, the juggalo/juggalette favorites head to the Spokane Valley Hasting’s (15312 E. Sprague Ave.) in honor of their brand new album release The Marvelous Missing Link (Lost). And they won’t perform at all. They’ll start signing things, anything you want, at 6 pm. Expect a DJ spinning ICP tunes and exclusive merchandise. We caught up with Shaggy 2 Dope (born Joseph "Joey" Utsler) while at a tour stop in Sioux Falls, South Dakota (“a lovely sunny and warm day,” he says). He discussed the decision to do an album signing tour, his favorite Faygo flavor and why people should attend the Gathering of the Juggalos. INLANDER: Do artists still do in-store album tours? How did you decide to do that? SHAGGY 2 DOPE: I don’t know, obviously some people because we are. We haven’t done it in so many years, though, and we thought: Let’s connect with the juggalos, connect with people. It gets really emotional and you get emotional with them. Having to go through that every day is a rough ride. Our music just changes people. People come up and tell us they were contemplating suicide and then they listened to our music and didn’t, and that’s tough. But the tons of positivity that comes with it equals it out, it’s a reason why we do this. We’re here to kick it with the everyday average Joe. What kinds of things do you like to sign for fans? There’s stuff that’s really hard to sign. Especially the tank tops and the hats, those are hard to sign, and if it’s raining, it doesn’t work. We have things to sign and pass out, too, though. Everyone gets something. What’s it like not performing at all out on the road? It’s weird being on the road not doing shows. We’ll go back to the hotel and then it feels like we should be doing a show afterward. When you’ve been on the road for so many years, the tour bus becomes a ship of doom. You get bored. You look forward to doing the show. We’re doing a lot of chilling out and watching movies. We’re definitely not out partying every night — we’re not as young as we used to be. What is it like going on tour with you guys? How much of an entourage do you have? With shows it’s three buses. But with this, it’s a skeleton crew with us, eight people. A really small crew. Doing stuff like this we don’t make money, it’s about the record and meeting people. Not everything makes money. How do you guys keep this fresh? You’ve been at this since the 1980s? Having this career is really fortunate, every time you get in the studio it’s a new experience. If you’re not nervous before a show then you got no business doing this no more. The way the whole industry has changed, you have to stay on top of that. We’re using old-school tactics with this tour, and pairing that with social media. When you were doing this back in the day you had to do record store tours. We didn’t get played on MTV ever so we had to do it on our own. You couldn’t just put out a video. Now you can be a star overnight. Even now, when we’re home we’re always in the studio. We haven’t stopped and enjoyed everything yet. Marvelous Missing Link? What is this filling in for people about the Dark Carnival mythology? When you were young what did you want to do when you grew up? Draw comic books, which I still do in my spare time. I never thought I’d have a normal 9-to-5 job. We work hard (at Psychopathic Records), but it’s still our pace. I don’t think I could ever do a real job. Why should people come out for Gathering of the Juggalos? Do you have a favorite Faygo flavor? Orange. Big orange fan over here. Forgive me, I have to ask … "Magnets, how do they work?" Magic, pure 100 percent magic.